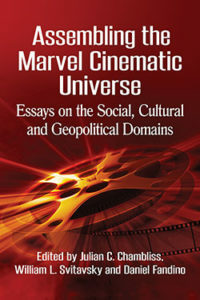 How does viewing the MCU through continuity literacy further a deeper understanding of its complexities? What types of individual literacy events could you identify in the MCU? What other types of broad literacy practices could you study through narratives in the MCU? Why have transmedia franchises such as the Marvel Cinematic Universe become more prevalent in recent years? What are the key characteristics of transmedia storytelling and how are they evident in the Marvel Cinematic Universe? How does a franchise-runner model differ from traditional models of film authorship? What is the relationship between ABC’s Agents of S.H.I.E.L.D. and the other properties that constitute the Marvel Cinematic Universe (MCU)? How does the television series reflect and/or depart from Marvel’s convergence strategy? What is the significance of Agents of S.H.I.E.L.D.’s responses to the releases of Captain America: The Winter Soldier (2014) and Avengers: Age of Ultron (2015)? How do the episodes that follow the films’ opening weekends break new ground on the small screen? How does Agents of S.H.I.E.L.D. present the story of the Inhumans both in its storyworld and for the MCU? What do the Inhumans become in the context of the MCU? Agents of S.H.I.E.L.D. highlights the role of destiny in the Marvel Universe. What story does the television series tell of its own process of becoming and evolution? What does it foresee in its own future? What is cultural trauma? How does cultural trauma shape societal institutions and call community members to engage in repair work? How does therapeutic public memory help alleviate the cultural anxieties resulting from a traumatic event? Discuss the ways The Avengers draws parallels between the 9/11 attacks and the fictional Battle of New York. How might these parallels work to evoke cultural trauma? Similarly, how might The Avengers work to alleviate post-9/11 cultural anxieties? In other words, how might The Avengers function as an example of therapeutic public memory? Do you think of the MCU movies as science fiction? Why or why not? How does interconnectedness add to the appeal of the MCU? Consider the models Coleridge, Tolkien, Gerrig, McGonigal & Caplan, Ferri, and Busselle & Bilandzic propose for how the elements of a story become internally believable. What examples from the MCU movies fit the patterns they suggest? Do the failings and complexities of the MCU’s past have particular appeal for the contemporary audience?